AllegroMedical.com presents The Tiemann Solid Tip Coude Intermittent Catheters. The Rüsch® Tiemann Intermittent Solid Tip Coude Catheter is an ERU Siliconized PVC Catheter with 2 staggered eyes and is sterilized for single use. 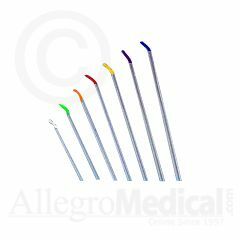 It has a pliable shaft with a flexible color coded curved tip which is especially helpful in negotiating difficult catheterizations. Rusch achieves this by modeling the tip separately and then joining it to the shaft. A notch on the catheter funnel is used to indicate the tip position. This product fits my needs. I was using rubber type and after a while I was not able to insert it. This one is perfect. But It takes many attempts to find suitable size. In my case it is 14 or 16.
by Misius from Long Valley, N.J.
Rusch from Allegro is a great intermittent catheter. I think it's a really great product so you don't have run back and forth to the Doctors...Very handy to have on hand. Intermittent catheterizat. Intermittent catht. Intermittent cath. For 17 years, I never had problems with straight catheters, but I developed a spastic reaction, according to the urologist that only coude catheters work most of the time. Suprapubic catheterization is the next step, but I discovered that Tiemann coude catheters really work. I have been using them for one year now without any problems. More expensive than the straight catheters but much less expensive than the other coude catheters. The catheter comes sealed individually in a plastic disposable sleeve. No the Tiemann tip catheter is only available as a single catheter. Your can purchase an insertion kit that comes with a collection bag as well as glove etc. Item# 76000 IC insertion kit. Yes. Apogee makes one in 1500 cc bag prelubricated.